Hockey — which we write about a lot in these parts — is the most tradition-rich of sports. The NHL is fast approaching its 100th birthday, a milestone that has already been achieved by one of its clubs, the Montreal Canadiens. The trophy for which its teams compete, the Stanley Cup, is well over a 100 years old and is the most famous trophy in sports. Among the on-ice traditions, there are some memorable ones. There is the practice of tossing octopi on the ice in Detroit. The post-playoff series handshake. The practice of growing playoff beards. Congratulating your goalie first, win or lose. Always celebrating as a team, never as an individual. The wonderful thing about a lot of these traditions is they are practiced at all levels of hockey, from peewee to the NHL. Another memorable hockey tradition: any time a player achieves a milestone, be it first or 500th career goal, first or 50th career shutout, a teammate will fetch the puck and set it aside to be presented to the player in the post-game dressing room. When this happens in an NHL game, the cameras will usually find the equipment manager wrapping the puck in white hockey tape and marking the details of the occasion with a Sharpie. This scene is repeated in a lot of NHL dressing rooms. 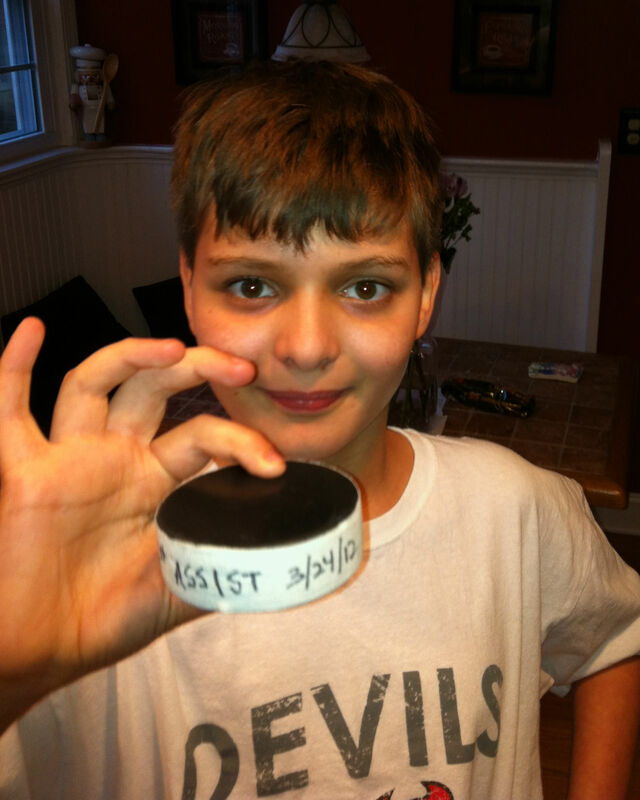 Ryan’s first “real” hockey season ended this past weekend, and it was nothing short of a rousing success. 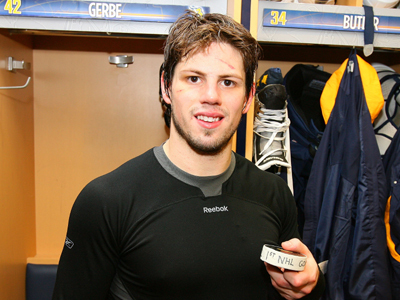 I took him to the first evaluations in October with a pit in my stomach and a lump in my throat. As soon as I had the conversation with his coach, I knew things would be fine. This was a coach that got it down to his sole. He believed in teaching and learning and having fun first and foremost. Do those things, and the wins — and smiles — will come. Ryan was able to keep up, but there was an ability gap between him and the rest of the kids. Yet Coach M played him in all situations, encouraging him every step of the way, and his teammates — and their parents — followed suit. Ryan had come close to scoring a goal a couple of times, but still entered the final weekend tournament without an official point on the year. Saturday afternoon, with his team down two goals in the third period, Coach M sent Ryan out on a power play. Veronica and I exchanged a glance. We love that Coach M plays the “next man up” no matter the situation. Still, at critical points in various games we shared worried looks as Ryan took the ice, hoping he wouldn’t be responsible for some sort of critical failure at a key juncture. 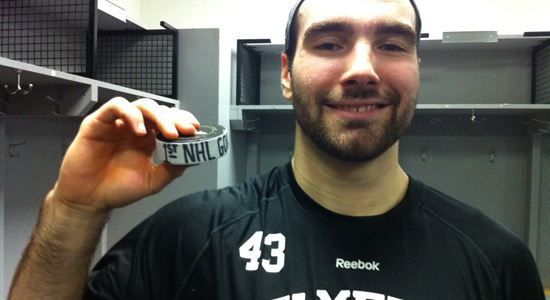 Yet another milestone puck, marked in Sharpie. We looked back at Ryan celebrating with teammates and continuing fist pumps all the way back to the face off circle. Such pure joy is wonderful sight to behold. I’m sure I was beaming like a split watermelon. The other parents all offered congratulations. In my excitement, it didn’t occur to me that Ryan had not had an assist all year. So it was a surprise when in the dressing room, as I helped Ryan with his skates, Coach M finished his post-game talk by singling out my son. As soon as the words came out of his mouth, all his teammates started yelling Ryan’s name and jumping up to offer high fives and congratulations. As they did so, Coach M pulled a puck out of his pocket and gave it to Ryan, who could not have looked more excited than if his beloved San Jose Sharks had just won the Stanley Cup. As this scene played out, I stepped back, wanting Ryan to have this moment with his coach and teammates without my interference. I felt like I was going to fall over, the rush of emotions was so sudden. I wish everyone could see this scene. This was a room full of 11 and 12-year-olds, almost all boys. A bunch of them are likely “the cool kids” at their schools. And yet they treat my son, with his awkward social interactions, his voice that’s always too loud, and his beginner-level hockey ability, as an equal. This is inclusion, and everything it is meant to be, and I am so incredibly grateful for this coach, these kids, and their parents who have clearly done a great job raising them. I’m pretty sure they have no idea what it means to Ryan or our family that they treat him as they do, but I will never forget it. 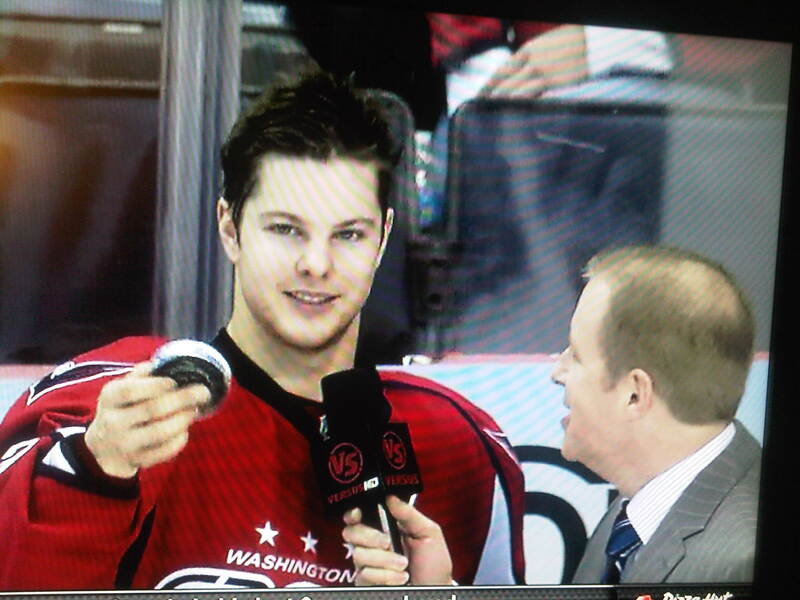 When I regained my composure, I did what any good hockey equipment manager does with a milestone puck. I wrapped it in white hockey tape, to be marked with the details of the occasion in Sharpie. When we got home, I took a picture. 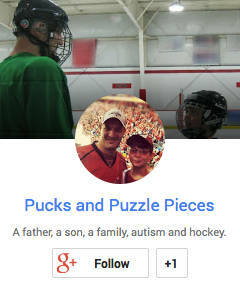 Can you tell which of the celebrating players in this post are in the NHL, and which one is on the autism spectrum? Terrific post! I’m all choked for you… yes, this IS inclusion! This is so incredible. Congratulations. You know I get this so much. Amazing. I’ve been holding back tears all morning from catching up on my blog reading but yours did me in. I’m crying with joy for you guys. And guess what? From reading your blog, I’m even getting interested in hockey 🙂 . I do like sports but I’m from Jamaica so I haven’t had any exposure to it before but you make it sound like a fab sport. I understand that feeling so well. For us, it’s ballet, but yeah, it’s that team reaching out to someone who struggles to fit in and making the environment safe to learn. So awesome. This is so awesome. I’m so glad Jim shared your link with me! Congratulations!